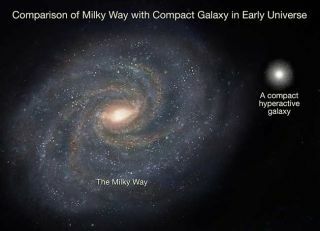 This illustration compares the size of the Milky Way to that of a dense, compact galaxy in the early universe. Stars in a distant galaxy move at stunning speeds ? greaterthan 1 million mph, astronomers have revealed. These hyperactive stars move at about twice the speed of oursun through theMilky Way, because their host galaxy is very massive, yet strangelycompact. The scene, which has theorists baffled, is 11 billion light-yearsaway. It is the first time motions of individual stars have been measured in agalaxy so distant. While the stars' swiftness is notable, stars in other galaxieshave been observed to travel at similarly high speeds. In those situations, itwas usually because they were interlopers from outside, or circling close to ablack hole. But in this case, the stars' high velocities helpastronomers confirm that the galaxy they belong to really is as massive asearlier data suggested. The compact nature of this and similar galaxies in thefaraway early universe is puzzling to scientists, who don't yet understand whysome young, massive galaxies are about five times smaller than theircounterparts today. "A lot of people were thinking we had overestimatedthese masses in the past," said Yale University astronomer Pieter vanDokkum, leader of the new study. "But this confirms they are extremelymassive for their size. These galaxies are indeed as bizarre as we thought theywere." Scientists used the new velocity measurements, conducted withthe Gemini South telescope in Chile and the HubbleSpace Telescope, to test the mass of a galaxy identified as 1255-0. Thesame way that the sun's gravity determines the orbiting speed of the Earth, thegalaxy's gravity, and thus its mass, determines the velocities of the starsinside it. The researchers found that indeed, the galaxy isexceptionally dense. Given its distance of 11 billion light-years, galaxy 1255-0is seenas it existed 11 billion years ago, less than 3 billion years after thetheoretical Big Bang. Among other galaxies we can observe from this timeperiod, about 30 to 40 percent are compact like this one. But in the modern, nearbyuniverse, astronomers don't find anything similar. Somehow, high-mass galaxies from the young universe grow insize but not in mass ? they spread out but maintain their overall heft ? tobecome the high-mass galaxies we see today. "It's a bit of a puzzle,"van Dokkum told SPACE.com. "We think these galaxies must grow throughcollisions with other galaxies. The weird thing is that these mergers must leadto galaxies that are larger in size but not much more massive. We need amechanism that grows them in size but not in mass." So far, such a mechanism is elusive, but astronomers havesome ideas. Perhaps these galaxies expand their girth by merging with manysmall, low-mass galaxies. Or maybe these galaxies eventually become the densecentral regions of even larger galaxies. "It could also still be that we are doing something wrong,"van Dokkum said. "But I think at the moment you could say that the ball issomewhat in the court of the theorists. Hopefully they can come up with somekind of explanation that we can test further."